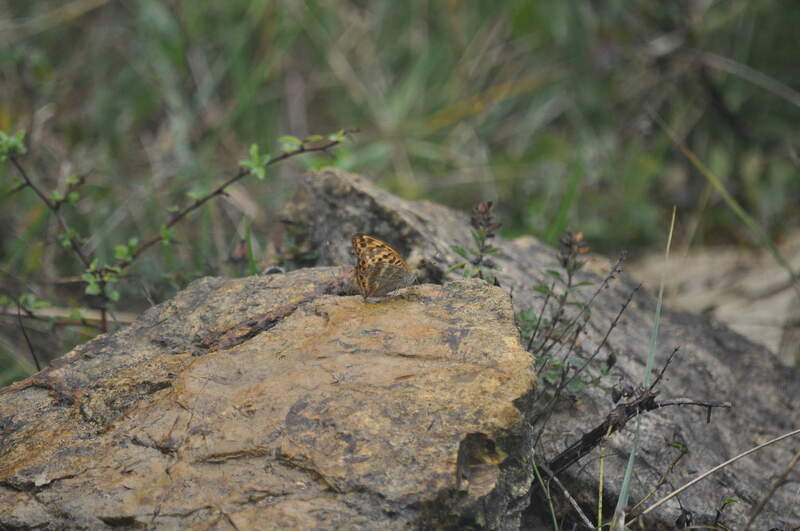 Butterflies and Moths we sighted at our retreat in Tuscany. 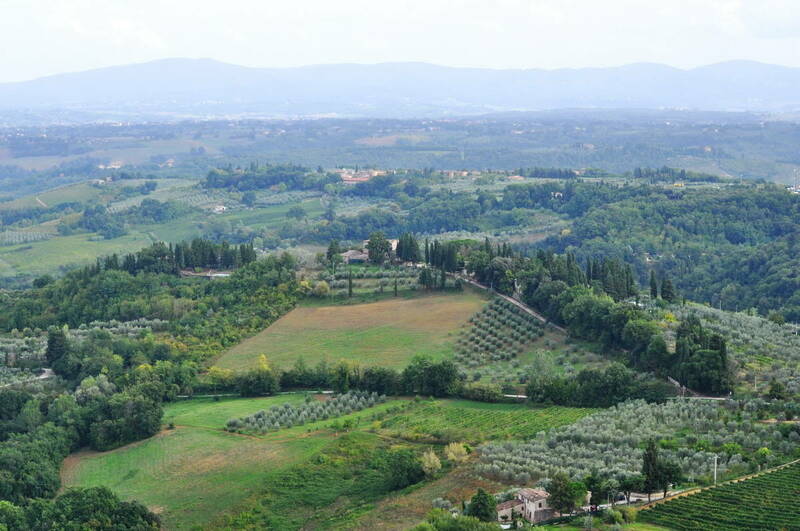 The morning following our arrival in Tuscany at first looked like it would be dreary and wet. 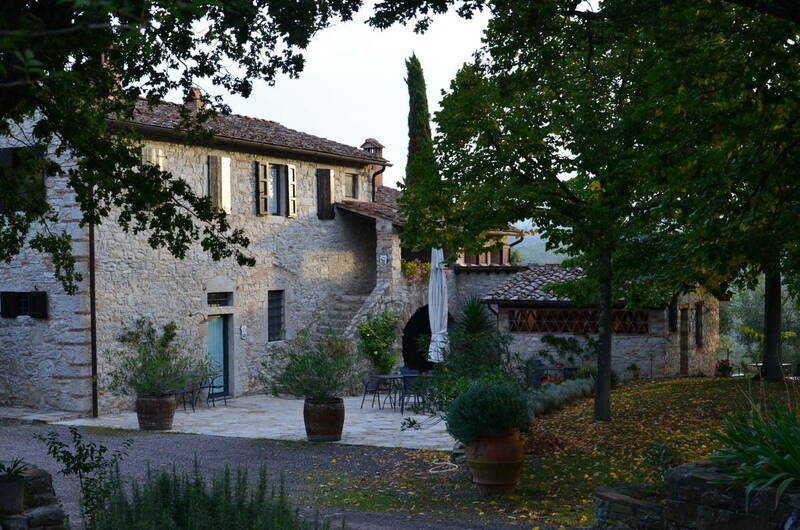 A light sprinkle of rain dampened the patio stones as we ate breakfast, but by the time we finished our fruit and cereal, warm September sunshine cast shadows of the tall trees surrounding our farmhouse, so we set off to explore the vineyard. 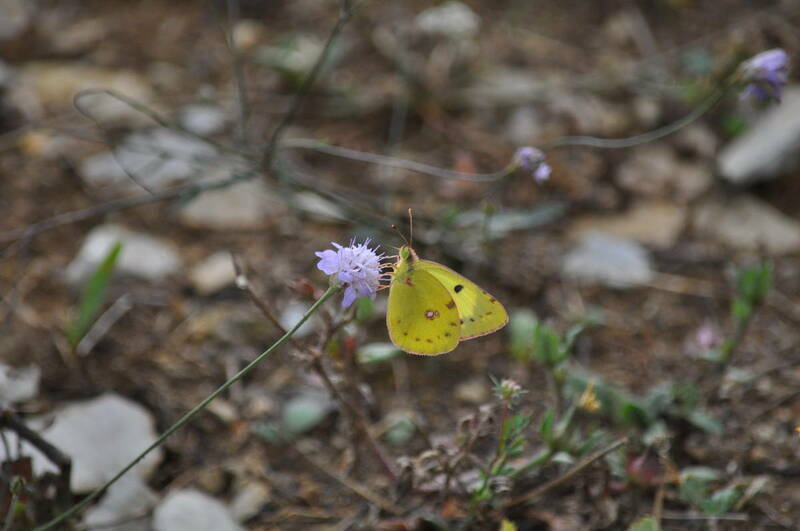 Butterflies and moths were everywhere in our dooryard, on the wildflowers and clinging to bushes and vines. Even before we left the area surrounding our patio, Bob and I were held up when we took note of some new-to-us butterflies basking in the warm morning sunlight. 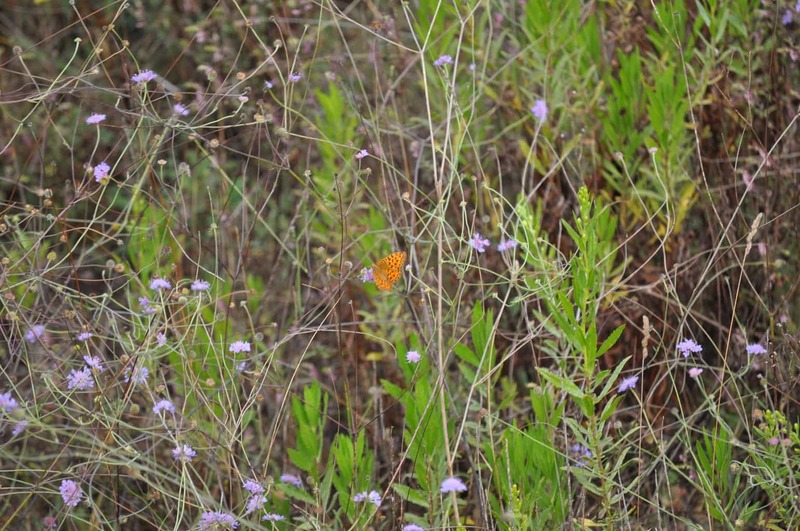 It helped that the yard was dotted with wildflowers upon which the butterflies could sit and sip the nectar. 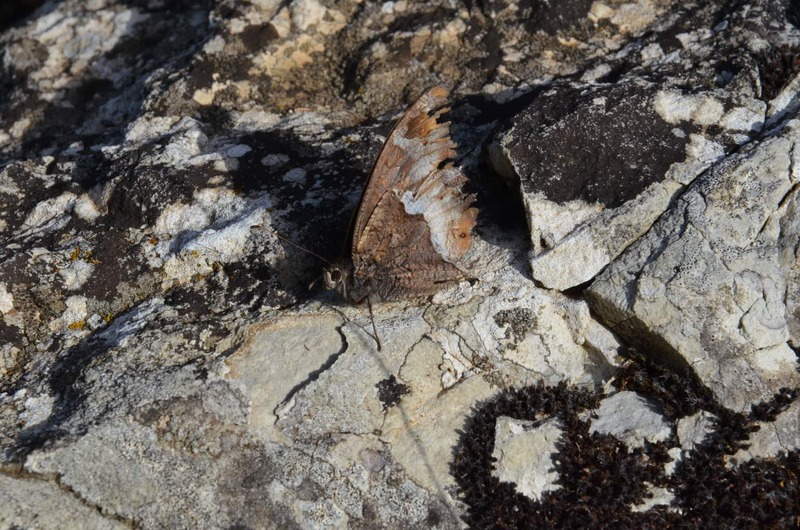 I am in no way an expert in identifying butterflies and moths, and before writing this blog post, I spent many, many hours over just as many days searching the internet and double-checking the identity that I had assigned to each species of butterfly and moth. I hope that my work has paid off. 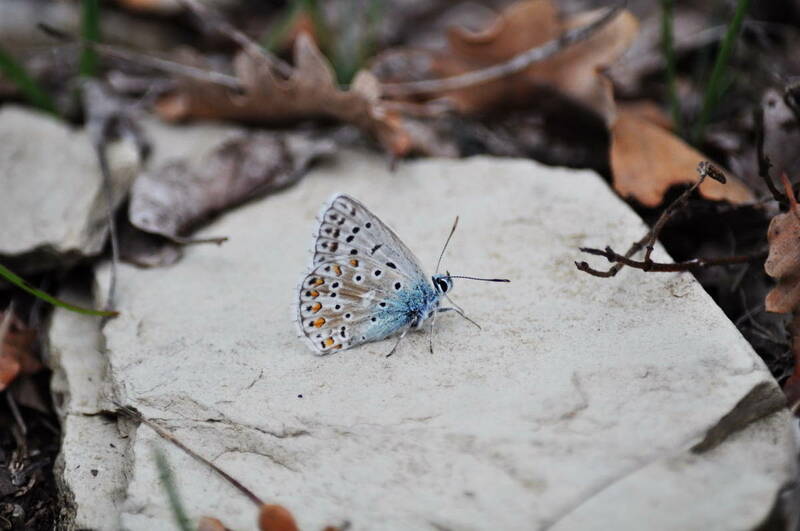 Here we have an Adonis Blue Butterfly, male. 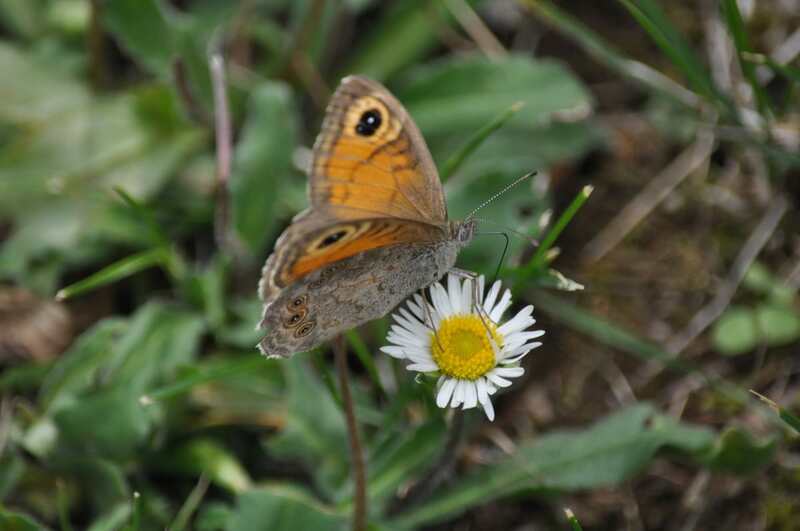 One of the first specimens to catch our eye was a female Large Wall Brown Butterfly perched on an Alpine Chrysanthemum right at ground level. 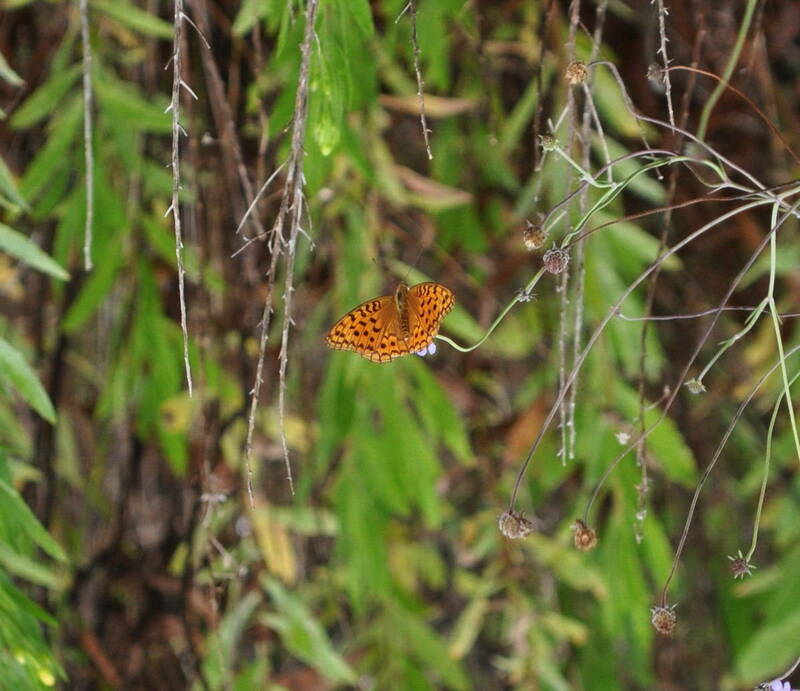 Actually, there were several in one area, and it kept us busy stepping lightly through the damp vegetation to acquire photos of these pretty butterflies. and another that provided a ventral view of its wings as it basked in a stray ray of sunshine where it peaked through the trees. 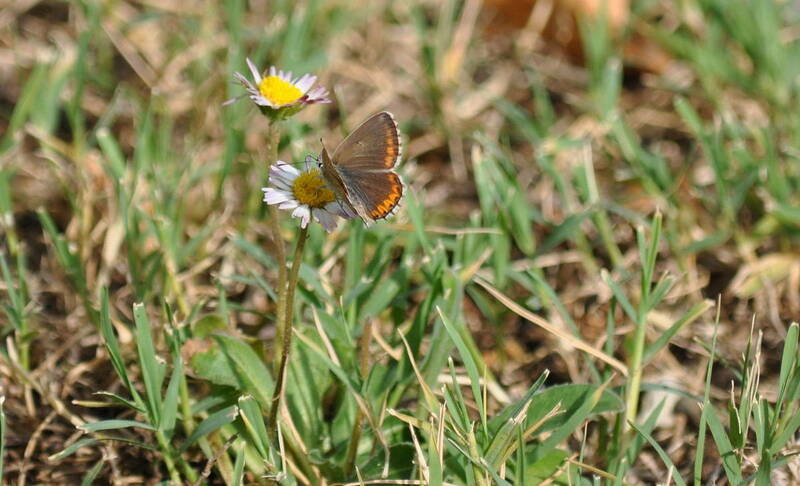 It was another clump of flowers, this time an Alpine Aster, that attracted a Brown Argus Butterfly. 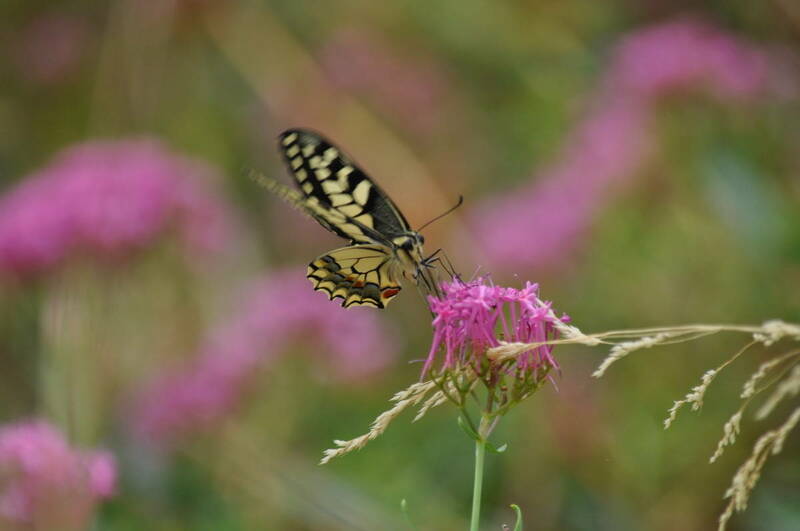 Autumn was marching on and the gardens held fewer cultivated plants with blooms from which the butterflies could acquire nourishment. Bob and I were in no hurry since we had planned to recharge our batteries after pounding the pavement in Rome for the previous few days. 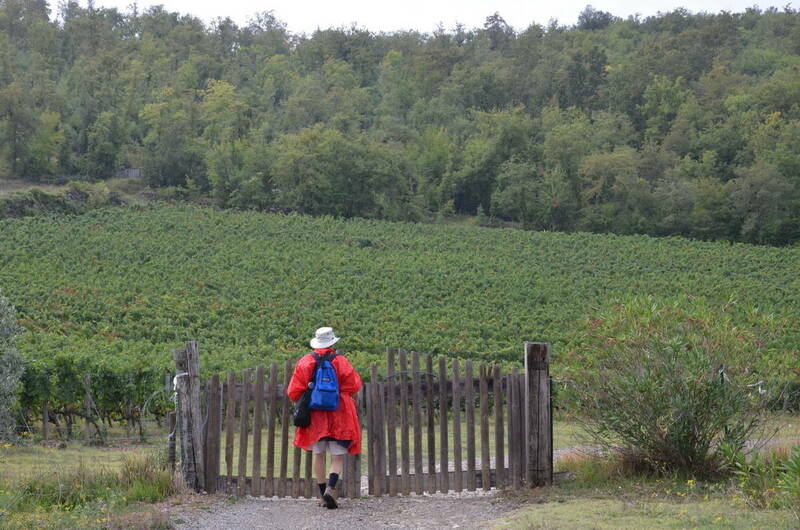 We strolled slowly around the dooryard and down the dirt laneway leading towards the entrance to the vineyard. 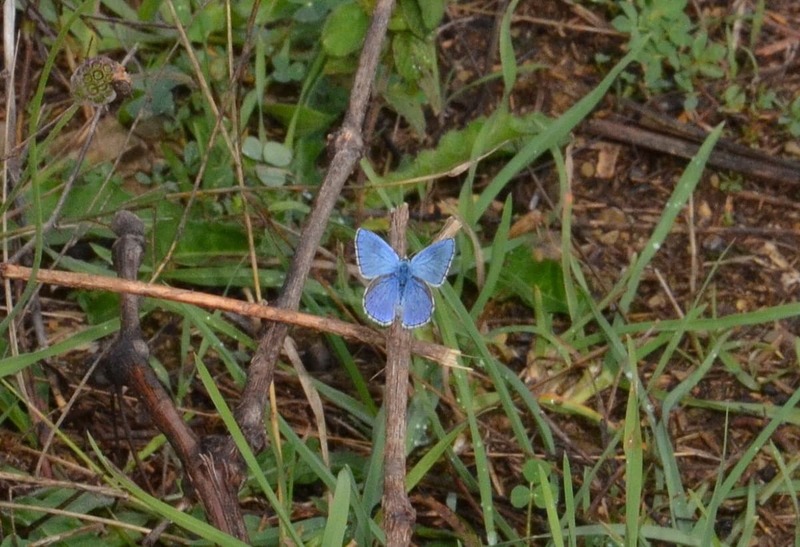 Gossamer wings of blue betrayed a number of small blue butterflies. 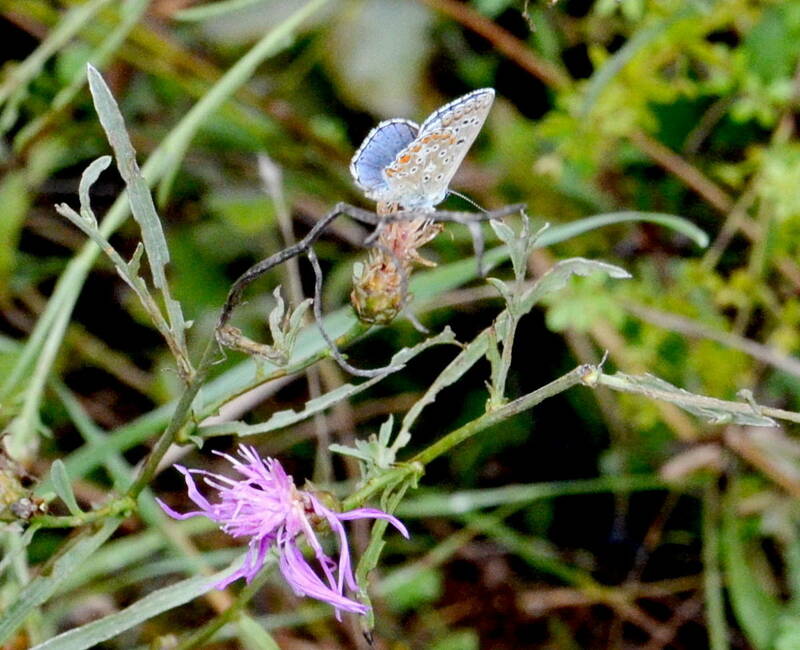 The first was an Adonis Blue Butterfly, male, perched on a fading European Michaelmas Daisy. 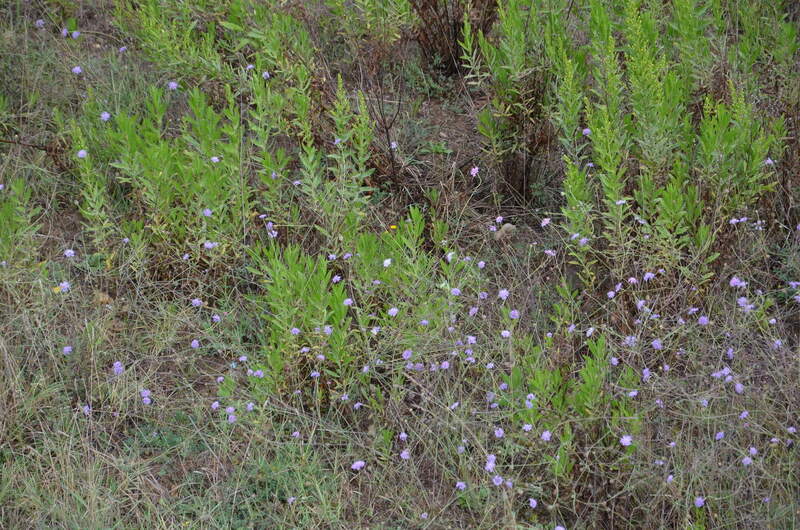 The blooms of this plant begin to show themselves in July and extend into October, but by September, already this specimen was shutting down for the season. 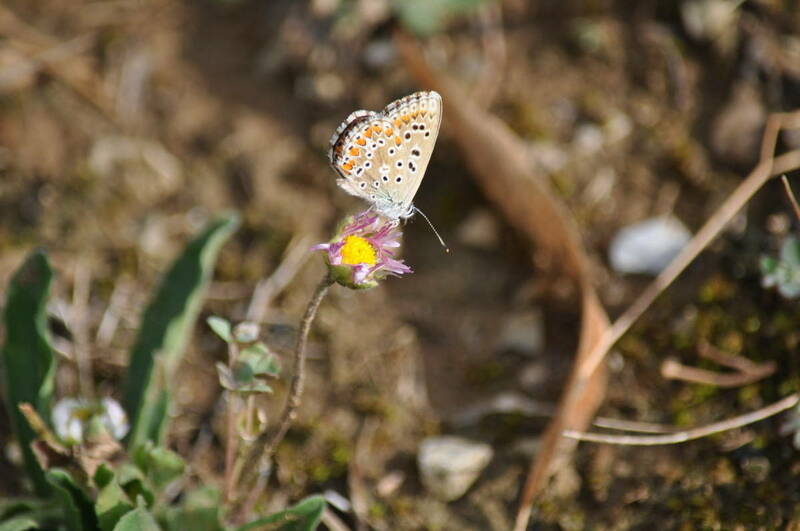 On another low-growing blossom, a female Adonis Blue Butterfly was sipping her fill, on another Alpine Aster. 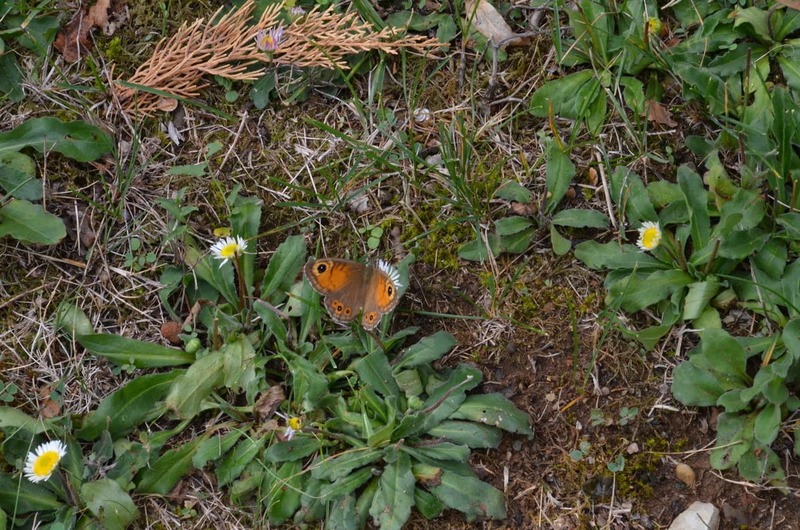 With these plants growing freely yet sporadically along the gravel shoulders, the butterflies moved at random from one side to the other keeping Bob and me in quick pursuit. 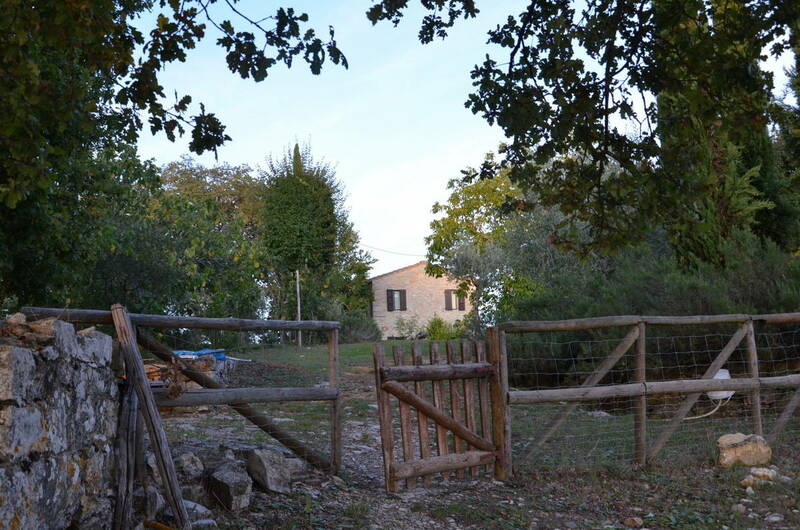 Did I mention before that the dirt road leading to our country retreat was quite rugged…steep and winding with stones jutting up, potholes worn down? 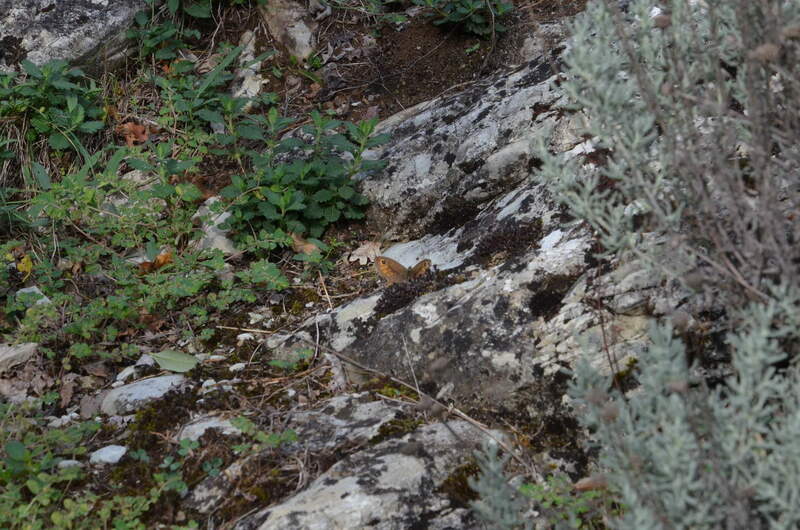 It was quite a rocky landscape, and sunbathing on one such stone laying to the side in the leaf litter was a Chapman’s Blue Butterfly. 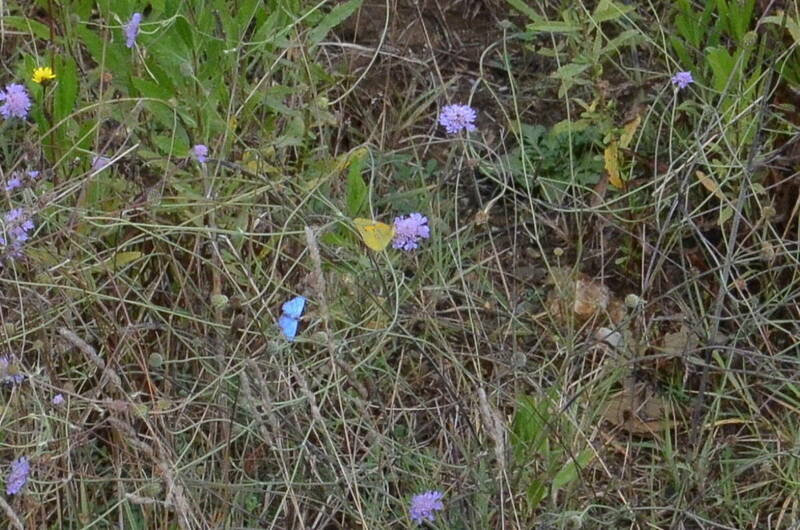 Moments later, in a semi-shaded enclave, we found another Chapman’s Blue Butterfly tasting the nectar of a Pincushion Flower, as I know it, or a Scabiosa Columbaria. 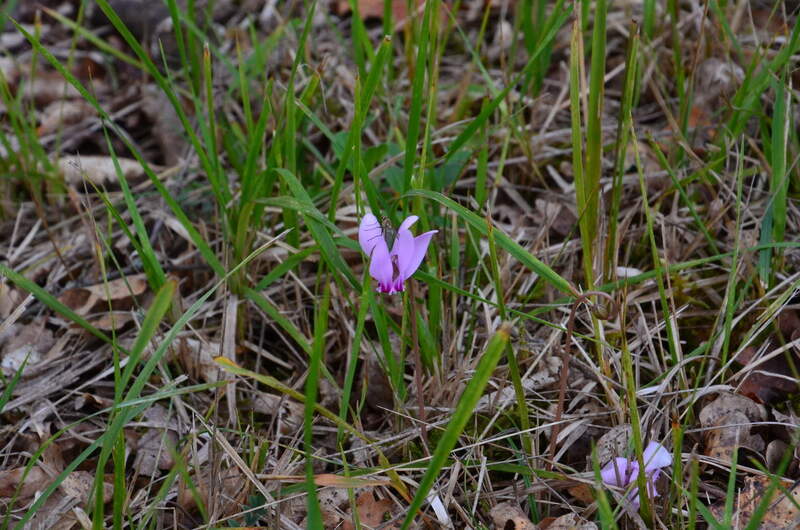 There were frequent patches of these dainty blooms around the perimeter of the vineyard and near the hedgerows that decorated the property. and it wasn’t until I looked later that I noticed the dangling leafy branches supported yellow buds ready to burst open. 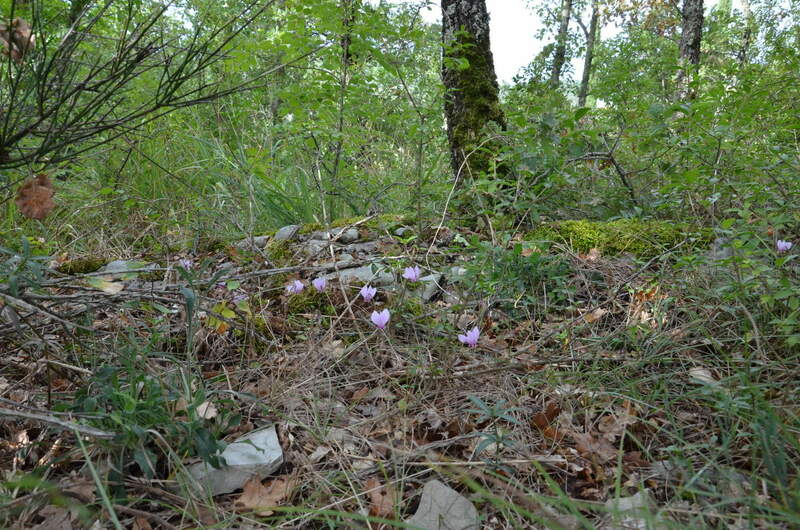 As we wound our way to the wooden gate marking the entrance to the vineyard, one shaded depression off to the right had Wild Cyclamen nestled among tangled grass, and I was smitten with the delicate complexity of each colourful blossom. 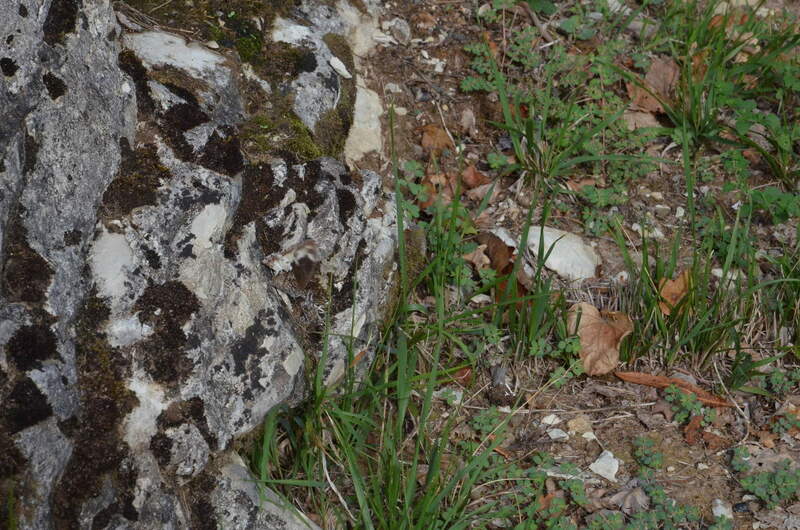 Others were marching up a rocky knoll, so I figured these plants weren’t very choosy about location. 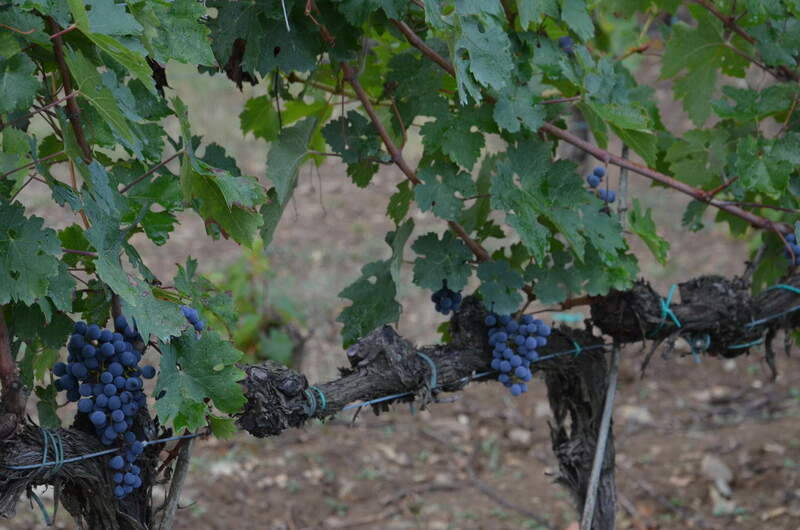 Clouds had given way to bright sunshine by the time we crossed into the cultivated rows of grape vines, and pleasant as it was wandering between the plants heavy with ripe fruits, it was really the proliferation of butterflies that impressed us. 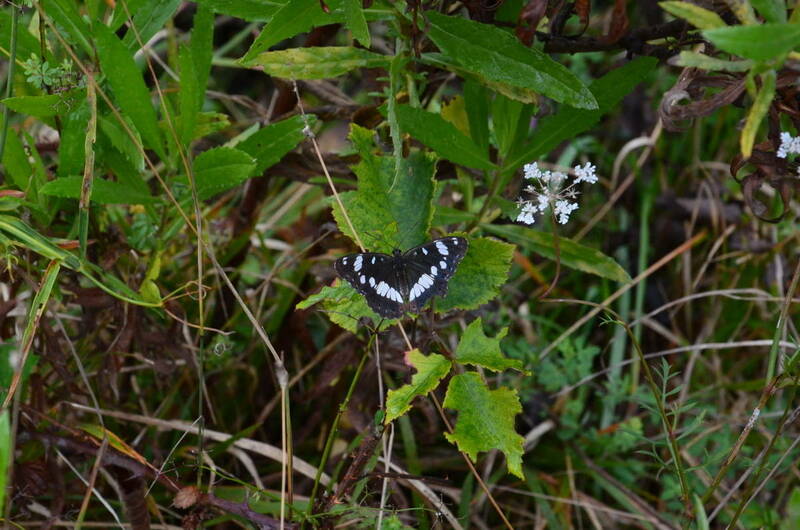 The only explanations we had for so many different species in one place was one, the wet weather forced them down to dry out, two, the butterflies were maybe preparing to migrate or overwinter given the season, and three, the abundance of wildflowers and juicy sweet grapes that scented the air. 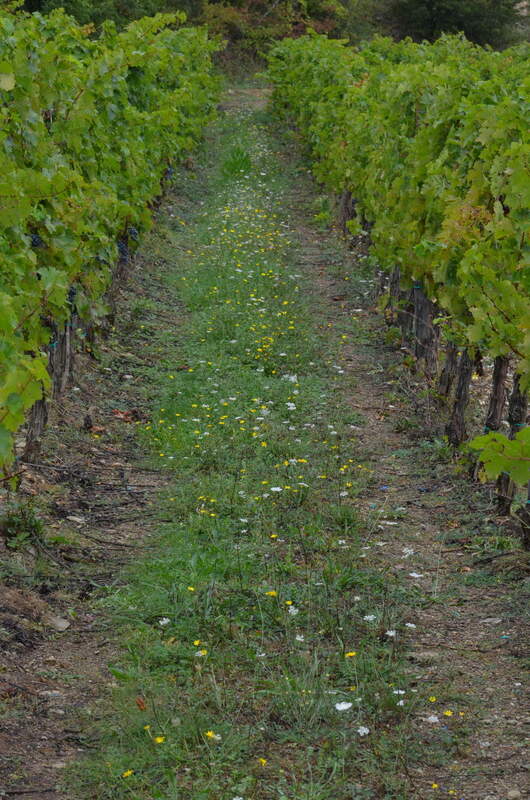 Yellow Oxeye and Yarrow Achillea Millefolium thrived in the open sunshine between the rows of vines. 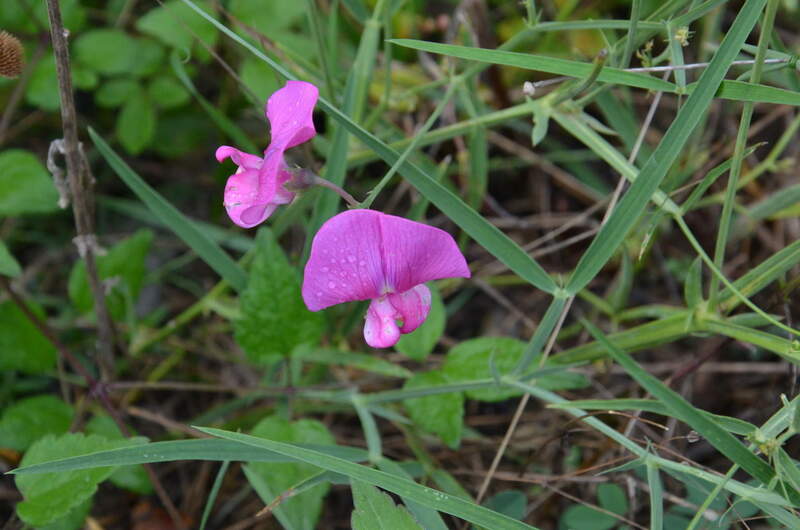 Narrow-leaved Everlasting Pea scrambled up small bushes on the fringes of the cultivated area. 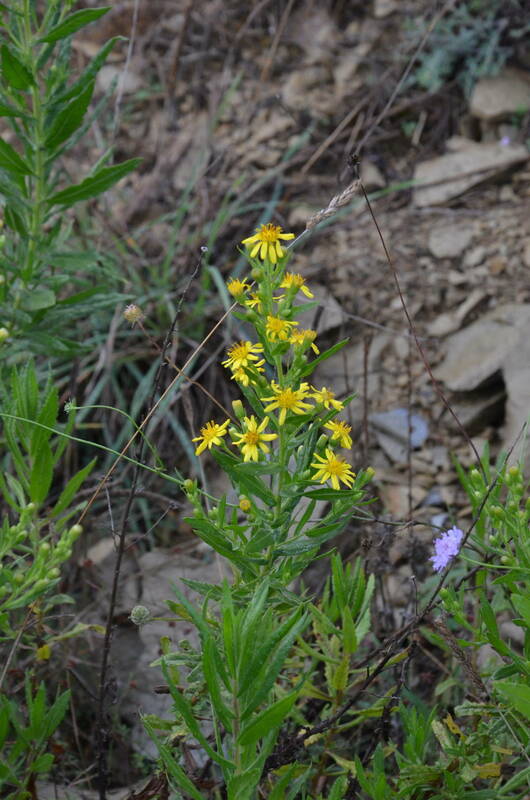 Common Ragwort dotted the cleared areas. 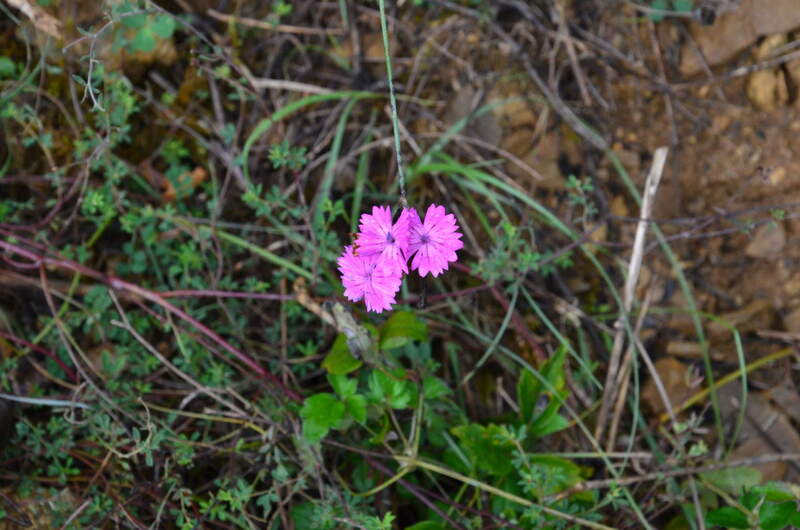 Carthusian Pink Dianthus gave a real punch of colour where they thrived in the dry, dusty soil. 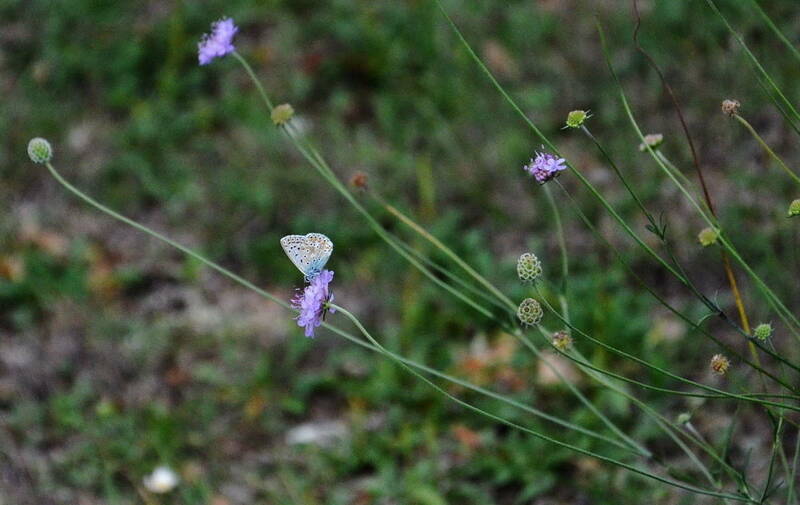 But the butterflies did not always choose a vibrant flower upon which to sit. 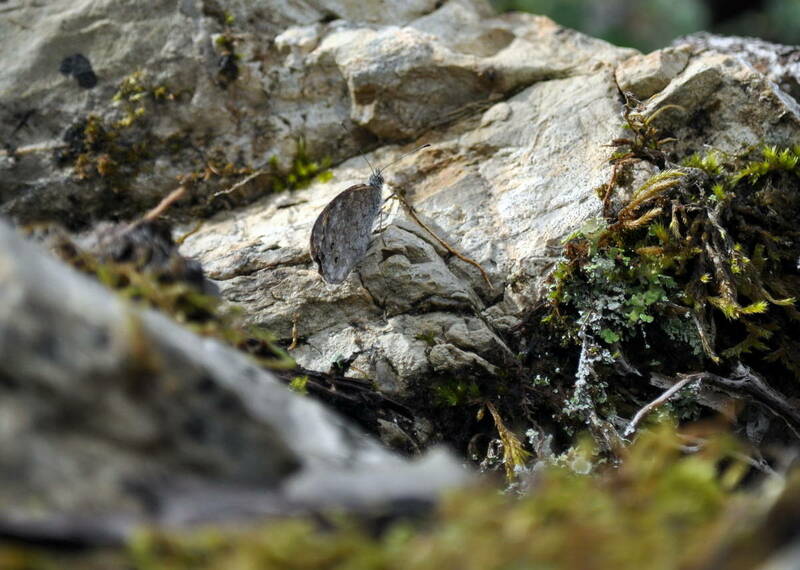 This Woodland Grayling Butterfly found a sun-warmed rock the perfect place to rest, and it is camouflaged to be almost invisible. Bet you can’t find it. 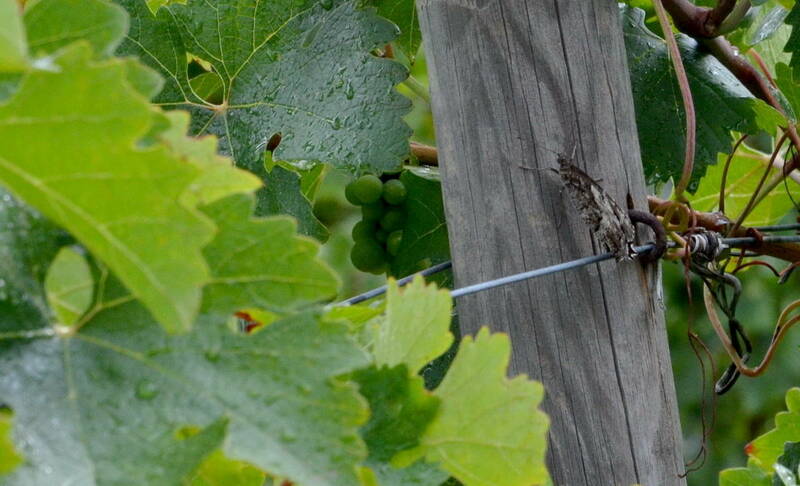 Another Woodland Grayling sought shelter beneath the large leaves of the vines on a post that assisted with camouflage. 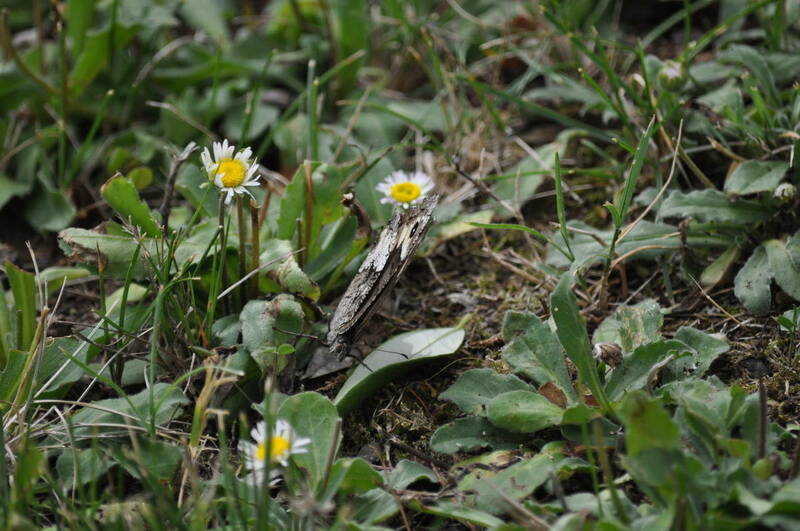 It was not long before we found a third Woodland Grayling that had made its way to an Alpine Chrysanthemum at our feet. 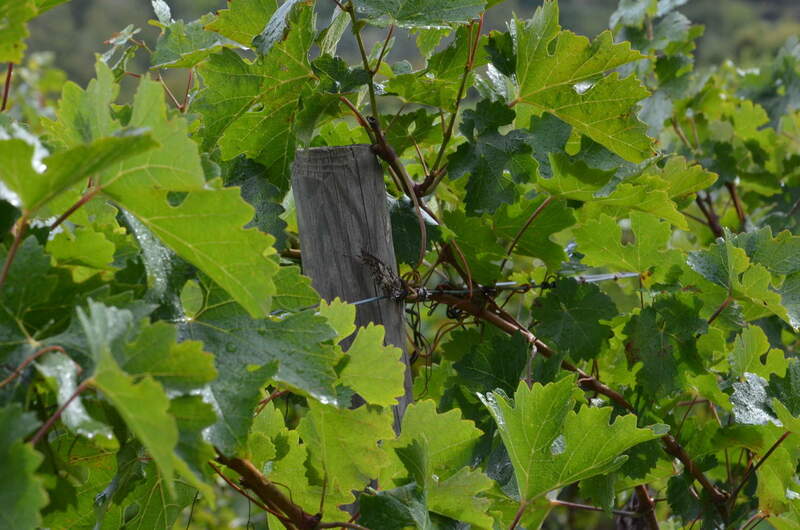 As the morning wore on, Bob and I made a circular swing around the perimeter of the vineyard. Intermittent showers had moisture running in streams off of our rain ponchos, and the viscous clay adhered to our hiking boots in gobs the size of a teacup. Talk about dead weight. 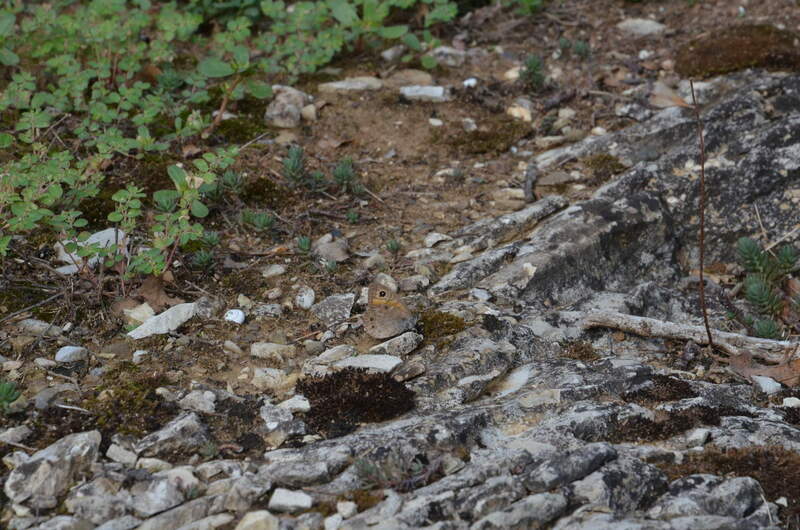 As a result, we often sought patches of limestone upon which we could scrape our boots clean. as well as this specimen that I have been unable to identify. Its wings were badly worn around the edges, but it was no less interesting. 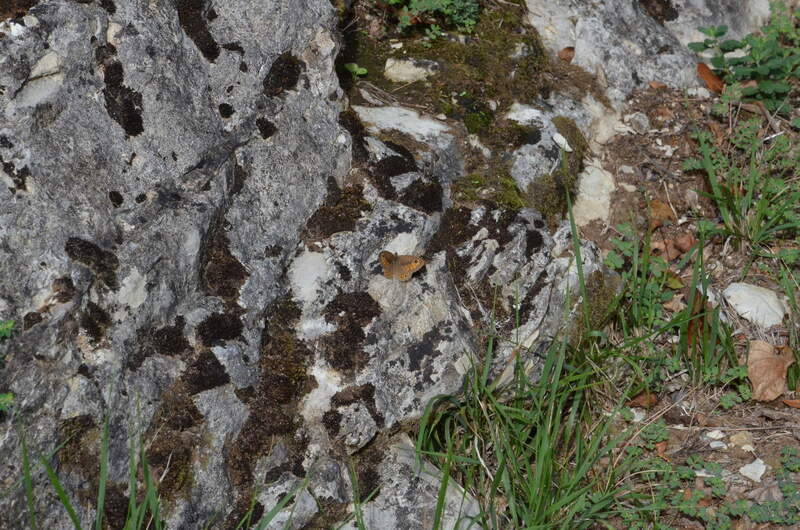 If you aren’t amazed already at the number of species sharing the vineyard, here is another similar of name, the Northern Wall Brown Butterfly likewise drawn to the warm limestone rocks to dry after a hefty downpour. 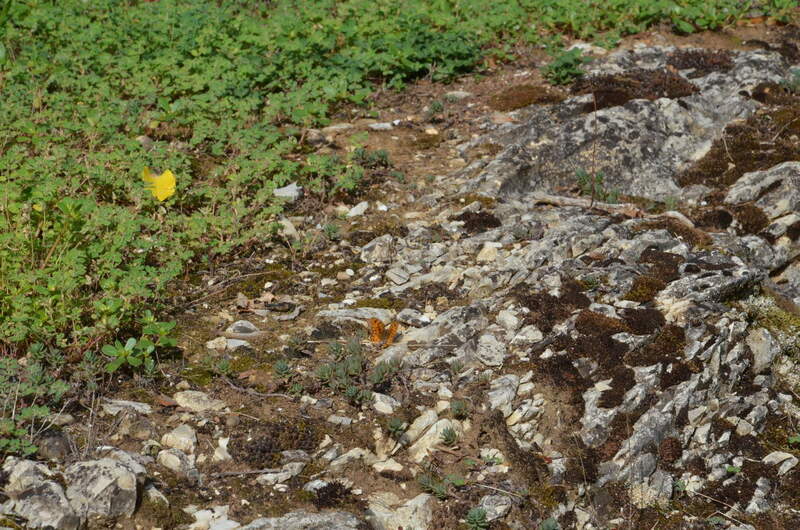 If not for many of the butterflies spreading their wings towards the warming sun, we might have missed seeing them. 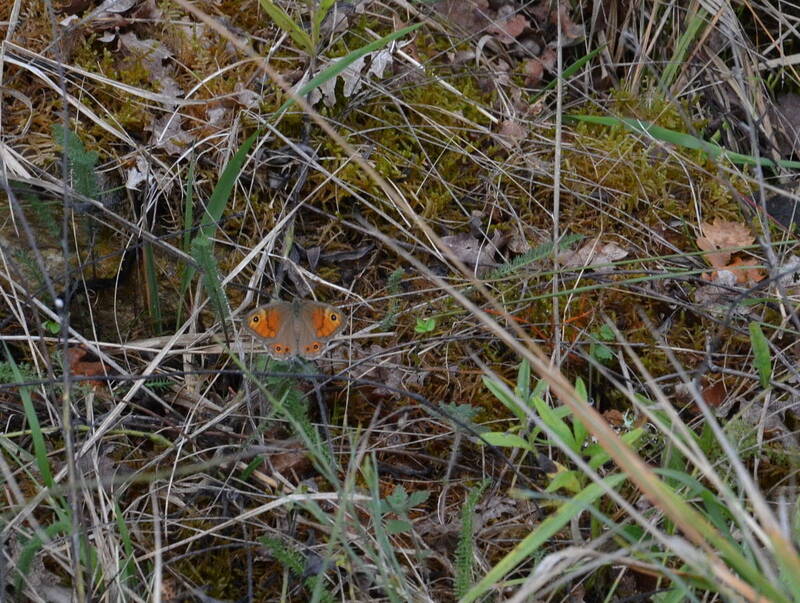 Only the flash of orange colour made it possible for Bob and me to keep track of this Northern Wall Brown Butterfly when it flitted from one perch to another. 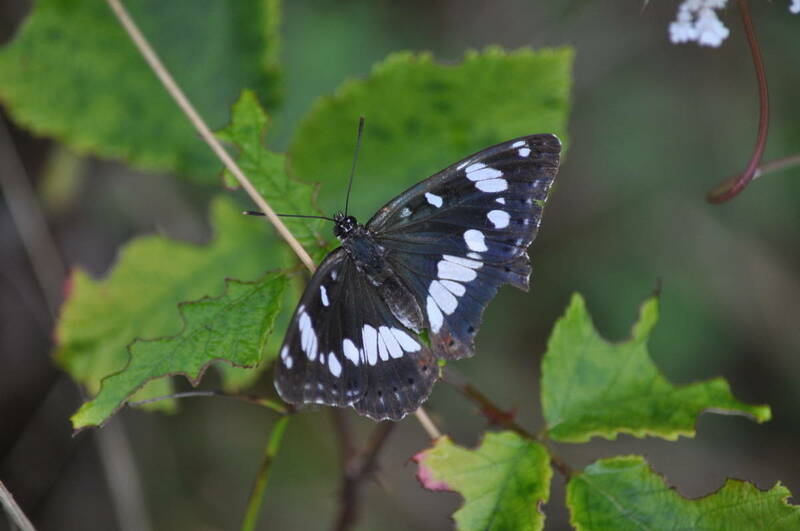 Perhaps the most striking butterfly we saw on our amble along the wooded periphery was a Southern White Admiral Butterfly. What made this particular species so interesting to Bob and me is the striking colour and pattern on the ventral side of the wings. 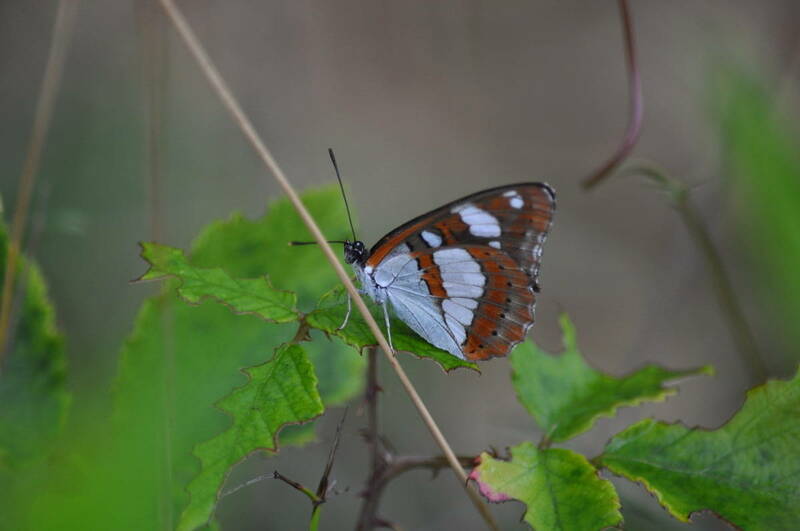 When we observed the Southern White Admiral Butterfly, we watched it zero in and land on the woody stem of a deciduous bush of which the leaves were well eaten. 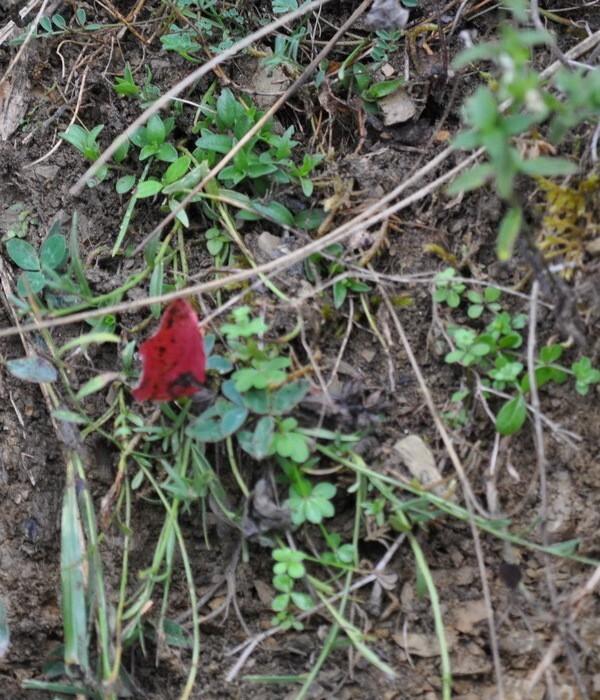 We wondered if perhaps that was the host plant of this species’ larvae. Honeysuckle is the preferred plant upon which the eggs are laid in late summer, and within days the larvae feast on the Honeysuckle leaves as they prepare to overwinter. 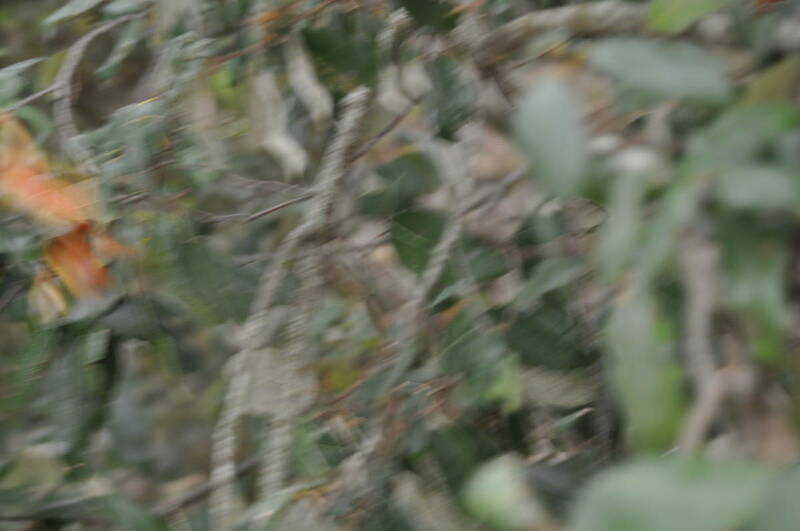 I have not been able to ascertain whether this is a Honeysuckle vine, but the habitat was consistent with that frequented by Southern White Admiral Butterflies, sunny glades or the fringes of forests where Honeysuckle gets a foothold, and certainly something had been consuming large sections of the leaves on the nearby plants. 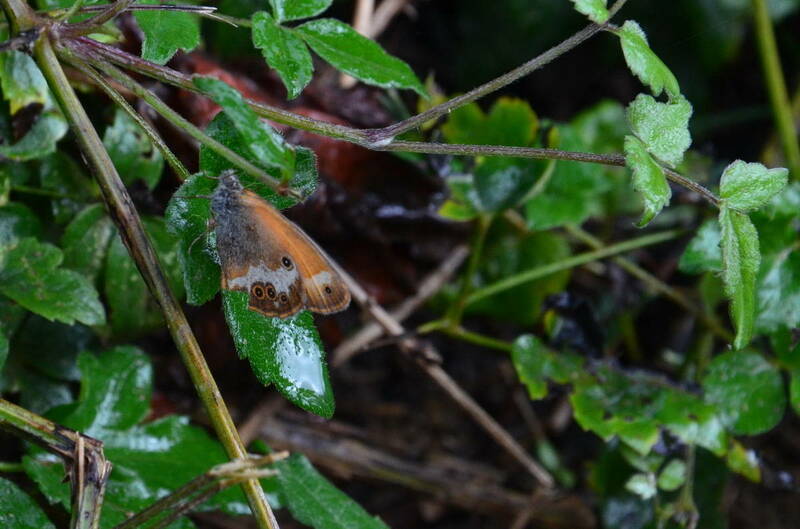 A Pearly Heath Butterfly took refuge during a brief shower under some shiny, wet leaves, and that is where we located this smallish butterfly. 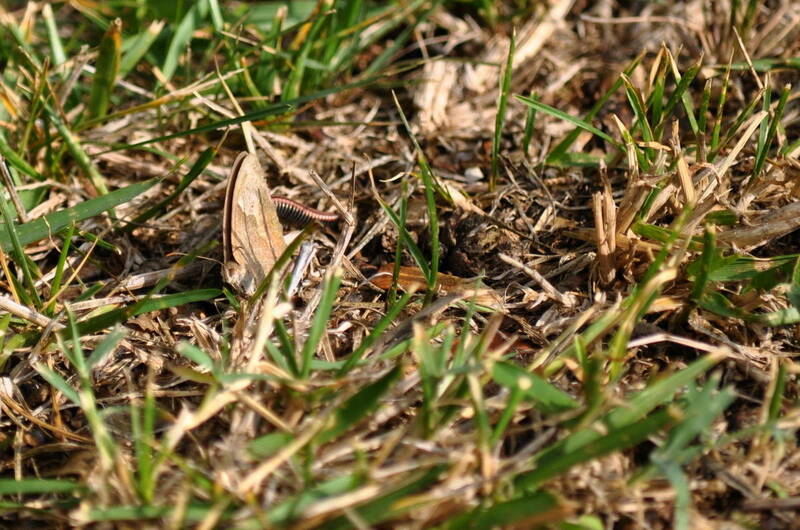 On the wing between June and September, eggs may already have been laid for larvae that will overwinter once in their 4th instar. 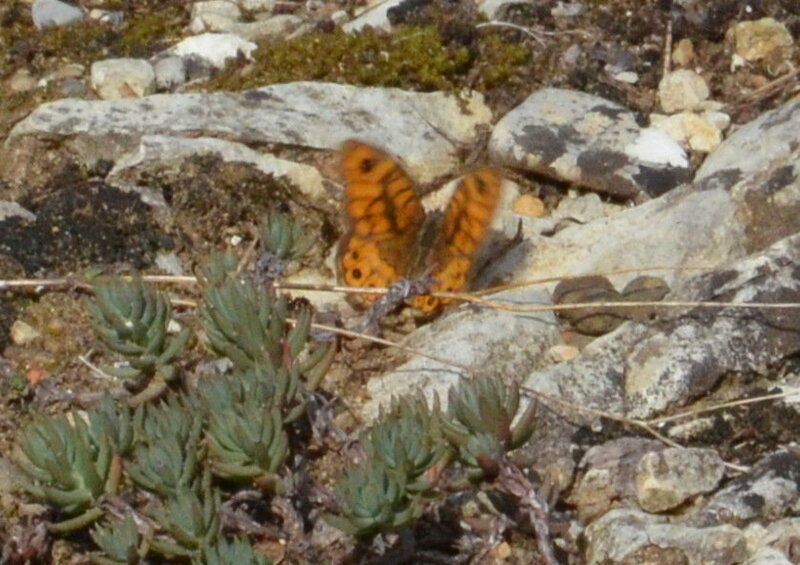 Pearly Heath Butterflies are among those species that sit at rest with their wings closed. our presence disturbed its restful state. 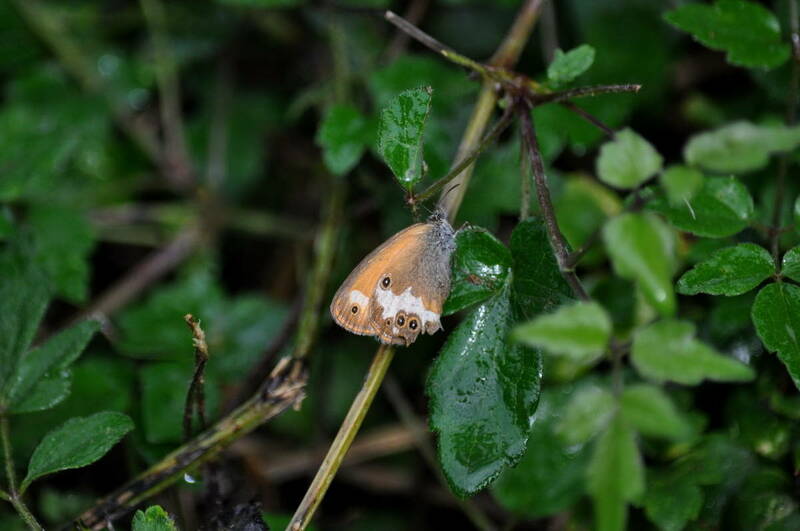 Then, it took an abrupt flight to a more protected location and settled on a small twig. 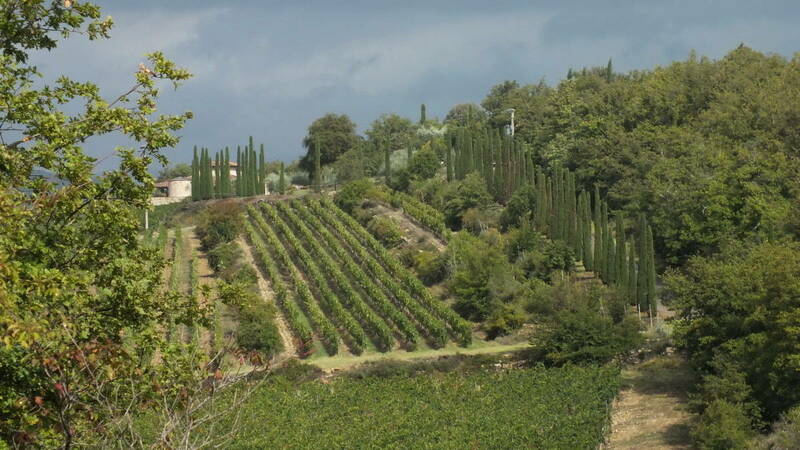 As the morning waned, the rain clouds finally drifted into the distance and bright sunshine had us heating up. 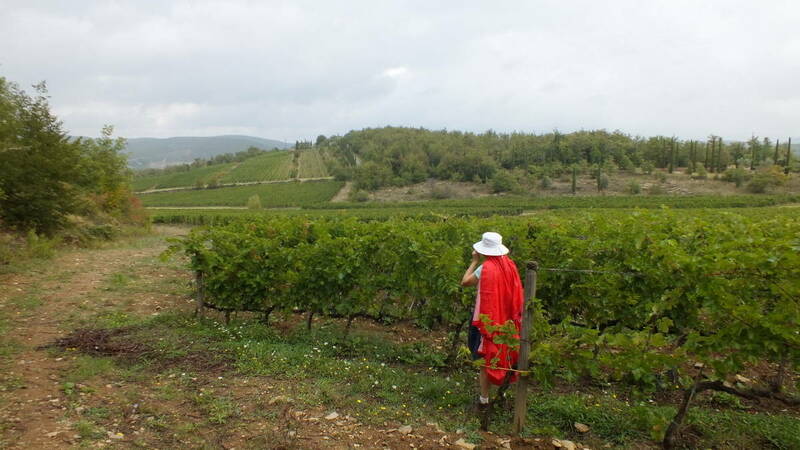 It was time to remove our rain ponchos and also time to make our way to the top of the vineyard in the direction of the winery. We chose to pass through a vast area that had been left to naturalize and was overgrown with tall grasses and wildflowers. 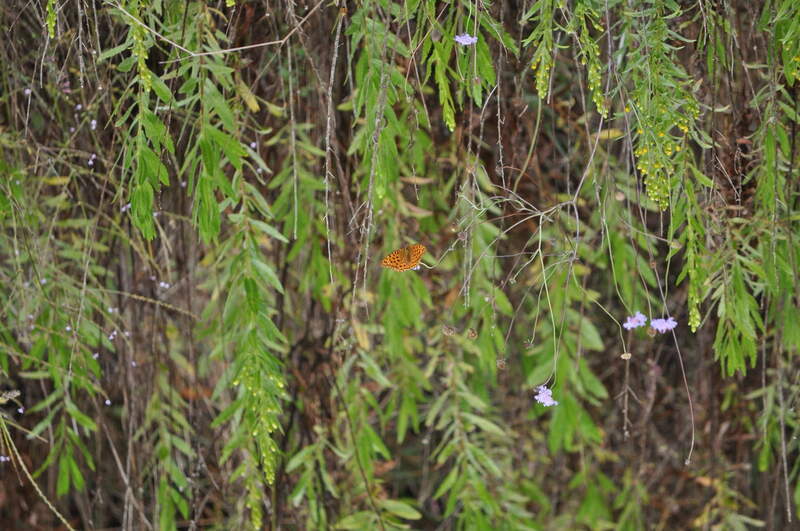 There, we discovered even more butterflies flitting about since their wings were now dried from the warm breeze. 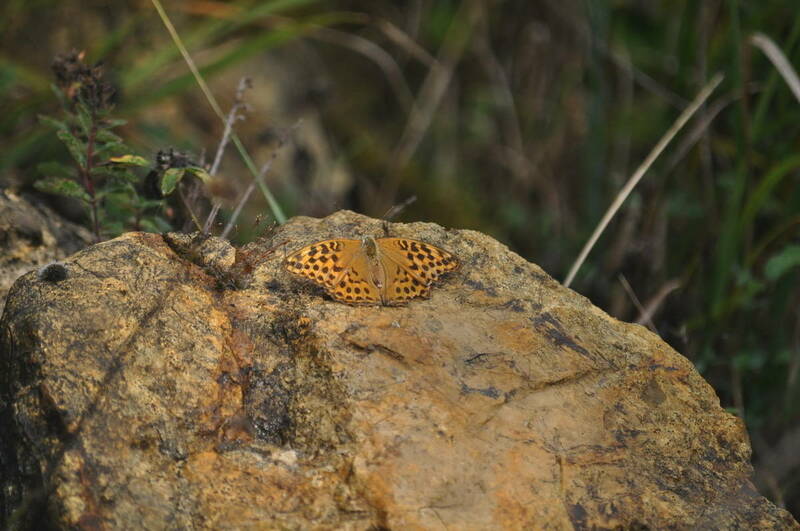 as well as a species of Fritillary that defied my attempts to identify it. 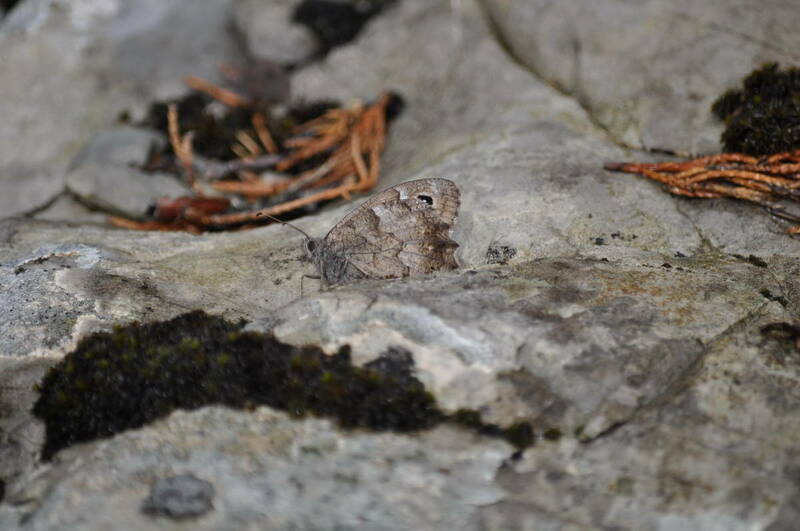 and what I think is a Grayling Butterfly that blended in very well on the grey rocks adjacent to the fireplace. 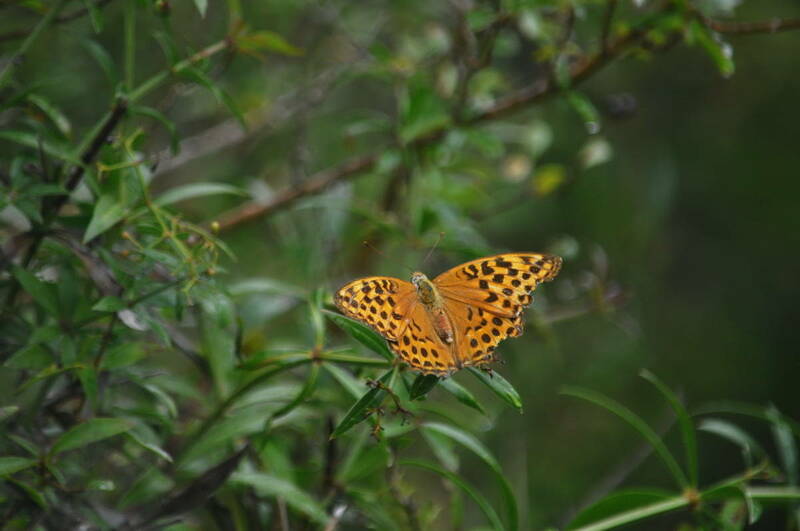 We could not believe our luck at seeing so many different species of butterflies all within a few hours, and yet our discoveries did not end there. 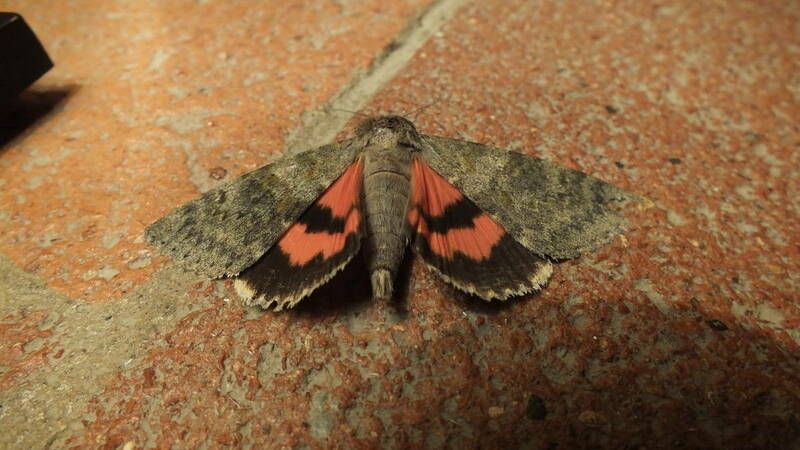 When we entered our cottage, we were saddened to find a beautiful French Red Underwing Moth laying dead on the bedroom floor. I seized the opportunity for a couple of extreme closeups of its anatomy. With our lunch dishes cleared, we ventured out to the swimming pool where the chaises longues lined up neatly in the shade invited Bob and me to wile away part of the afternoon. 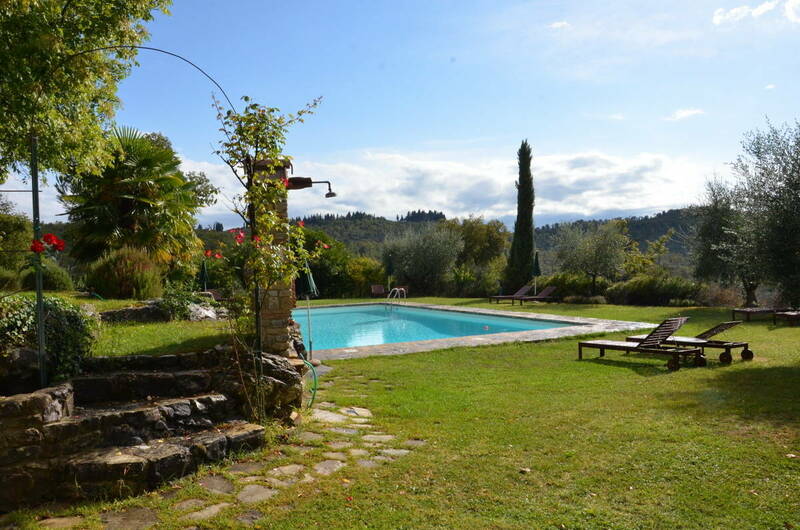 As I casually dipped a toe into the pool, Bob noticed a flicker of movement and flash of orange that drew his eyes away from the panoramic view to an overgrown thicket by an out building. 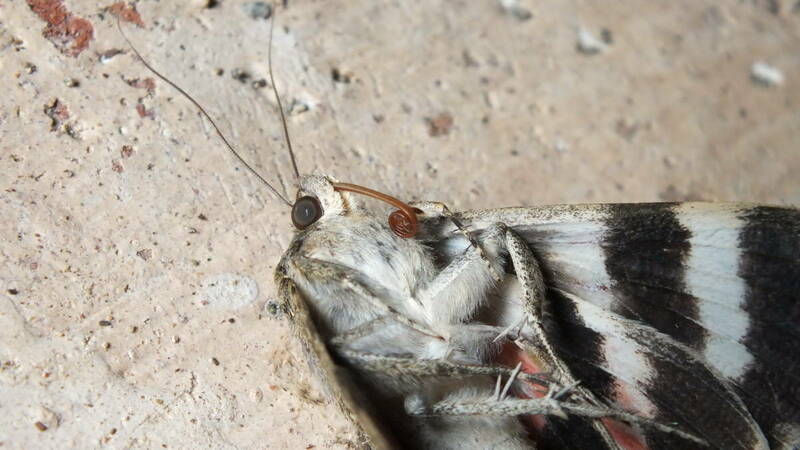 I kept an eye on this insect while Bob dashed inside to grab the camera. 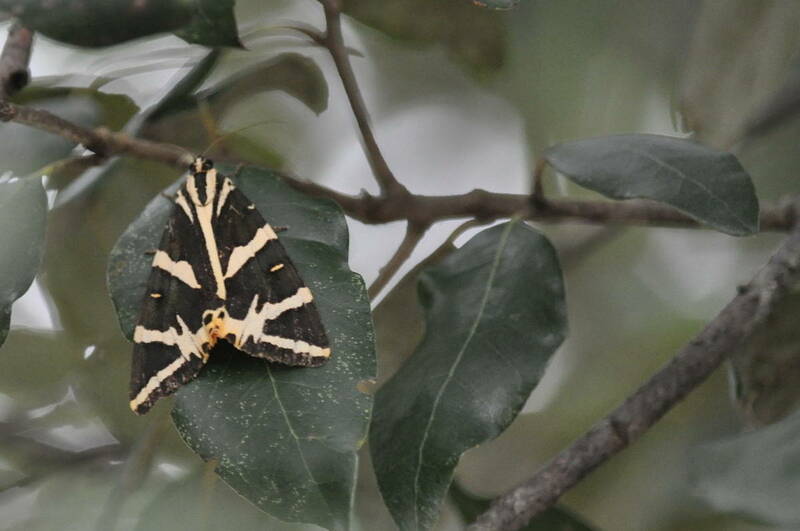 It turned out to be a Jersey Tiger Moth, so named for the yellow and black striping on the dorsal surface of its wings. We pursued it for a few short minutes before it disappeared into the shadows of the roof’s overhang. 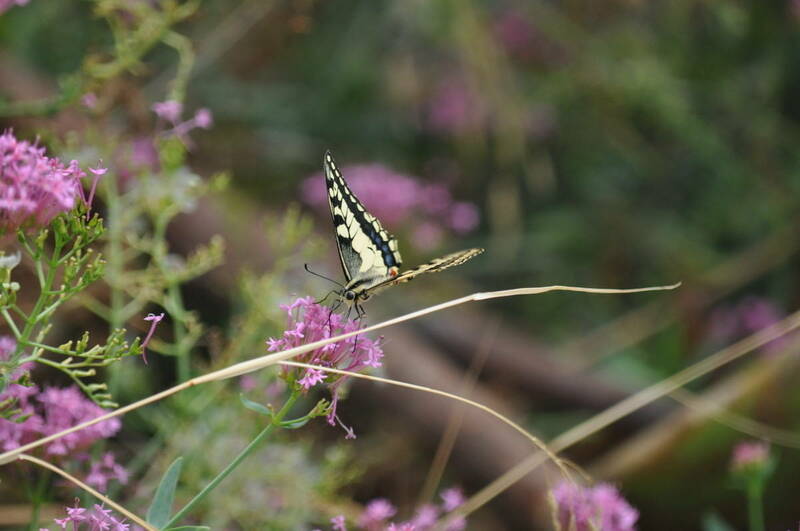 And lastly, on an excursion the next day to Cinque Terre, in the village of Corniglia, our enjoyment of a gorgeous seascape was made complete when we noticed, just below the protective stone wall of a lookout, this striking Corsican Swallowtail Butterfly. How perfect was that? 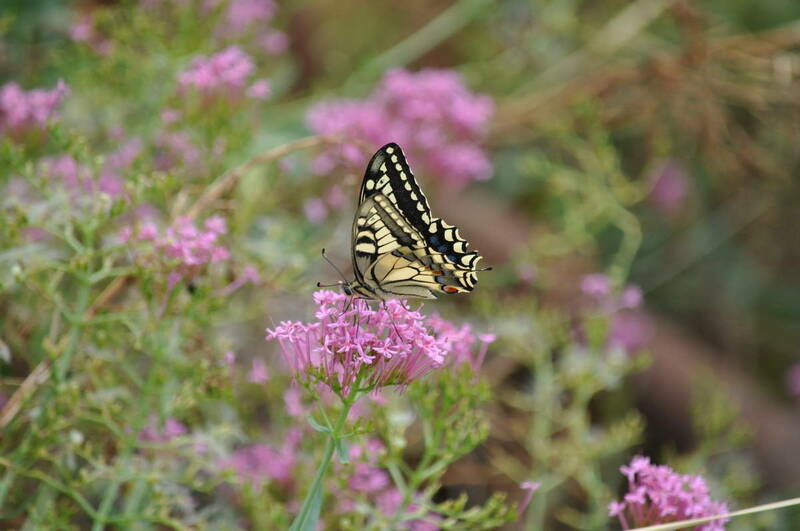 An ample collection of fragrant pink blossoms resembling those of Phlox had compound flowerheads that kept the Corsican Swallowtail Butterfly totally absorbed while Bob and I tried to get clear shots of it through a mass of cacti that always seemed to block our view. 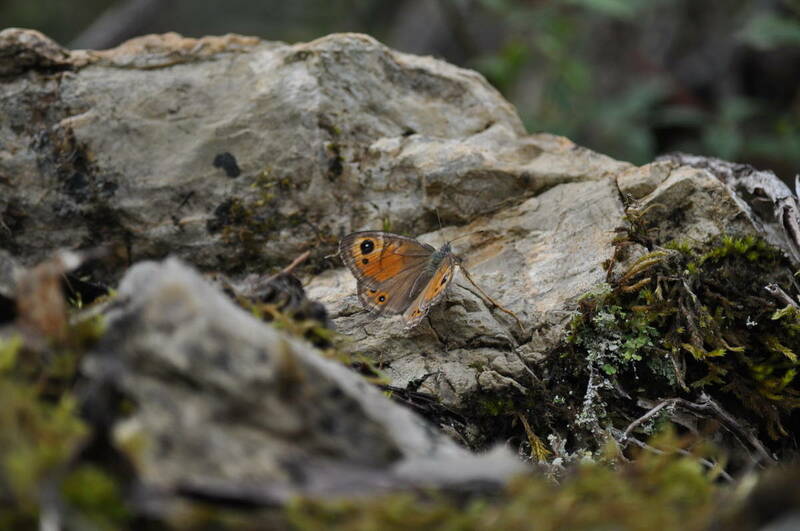 Bob and I are intrigued by all facets of nature, large and small, and to see such a variety of butterflies and moths in Tuscany made our experience of that most iconic landscape all the more interesting and complete. 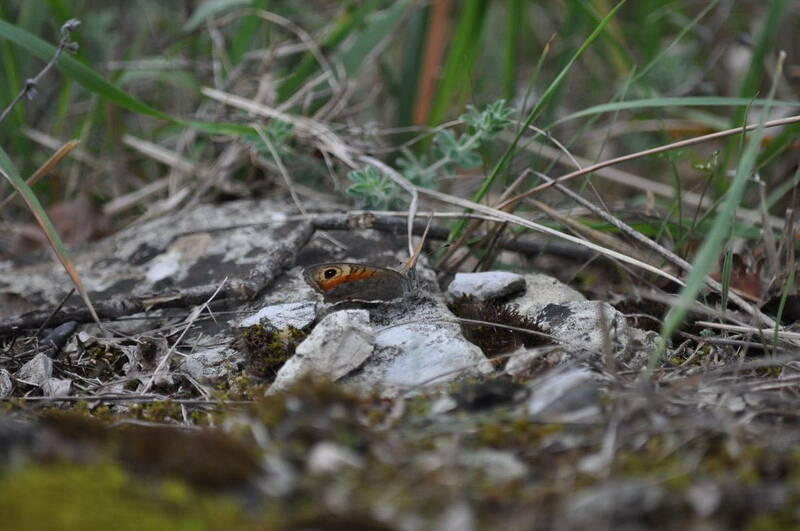 Little did we know that, once in the Po River Delta region, we would be greeted with almost as many new species of butterflies as we had already seen. It kept us really busy!